Shadow Tag Prevents the foe from escaping. Enemy Pokemon cannot run or be switched out. 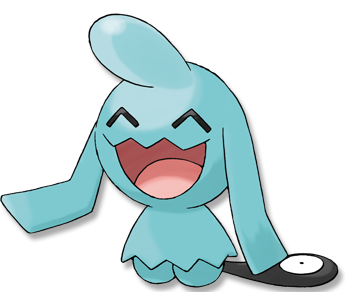 Telepathy* This Pok�mon does not take damage from friendly Pok�mon's moves, including singletarged moves aimed at it. endurance and is trained to dole out powerful counterattacks. Emerald A WYNAUT loves to eat sweet fruits. It cleverly picks fruits using its earlike arms. They gather in fruit gardens, drawn by the fragrance. FireRed It tends to move in a pack with others. They cluster in a tight group to sleep in a cave. Leaf Green It tends to move in a pack with others. They cluster in a tight group to sleep in a cave. Diamond/Pearl It grows strong by pushing up against others en masse. It loves eating sweet fruit. Platinum It grows strong by pushing up against others en masse. It loves eating sweet fruit. Heart Gold It tends to move in a pack. Individuals squash against one another to toughen their spirits. Soul Silver It tends to move in a pack. Individuals squash against one another to toughen their spirits. Black It grows strong by pushing up against others en masse. It loves eating sweet fruit. White It grows strong by pushing up against others en masse. It loves eating sweet fruit.